As magnetic resonance (MR) has become increasingly more popular for assessment of hip and groin pain, our knowledge of the many pathologic conditions affecting the hip and pelvis has grown. 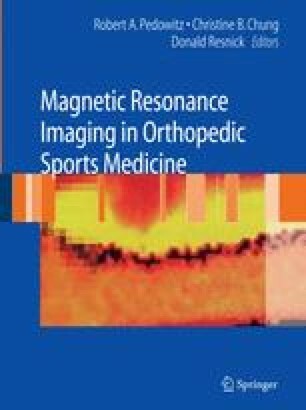 Magnetic resonance has contributed significantly to our understanding of sports-related injuries as well as to underlying conditions such as femoroacetabular impingement, which can lead to pain and limited range of motion. Localization of pain originating from the hip or pelvis is clinically difficult. Patients present with nonspecific complaints of hip pain, groin pain, pelvic pain, and even medial knee pain. As discussed in the previous chapter, the differential diagnosis includes internal derangements of the hip, femoroacetabular impingement, loose bodies, bursitis, stress injuries and stress fractures, musculotendinous injuries, tendon avulsions, sports hernias, as well as nerve injury, arthritis, and infection. The site of injury may be the hip joint, the symphysis pubis, the sacroiliac joint, the many sites of tendon origin and insertion, as well as the anterior abdominal wall and inguinal canal. The athletes most at risk for these injuries are those engaged in sports such as soccer, ice hockey, and track—sports that involve kicking, sprinting, and pivoting.